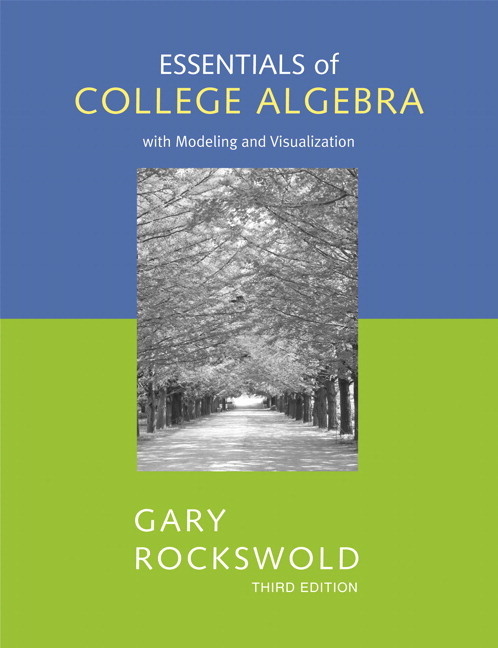 Gary Rockswold teaches algebra in context, answering the question, “Why am I learning this?” By experiencing math through applications, students see how it fits into their lives, and they become motivated to succeed. Rockswold’s focus on conceptual understanding helps students make connections between the concepts, and as a result, students see the bigger picture of math and are prepared for future courses. 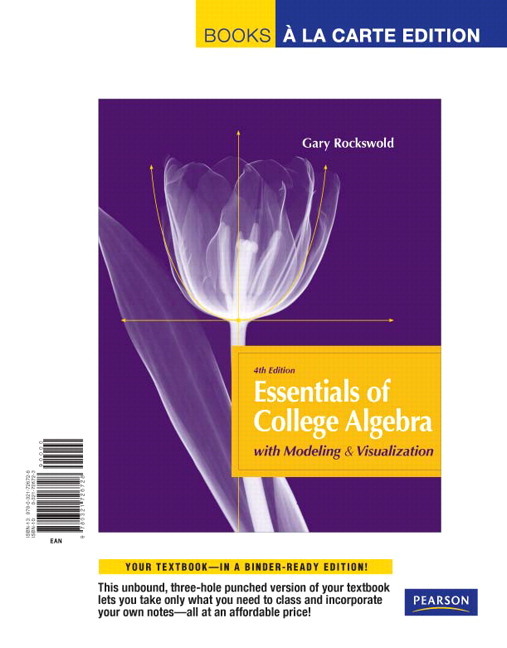 This streamlined text–Essentials of College Algebra with Modeling and Visualization, Fourth Edition–covers linear, quadratic, nonlinear, exponential, and logarithmic functions and systems of equations and inequalities, which gets to the heart of what students need from this course. 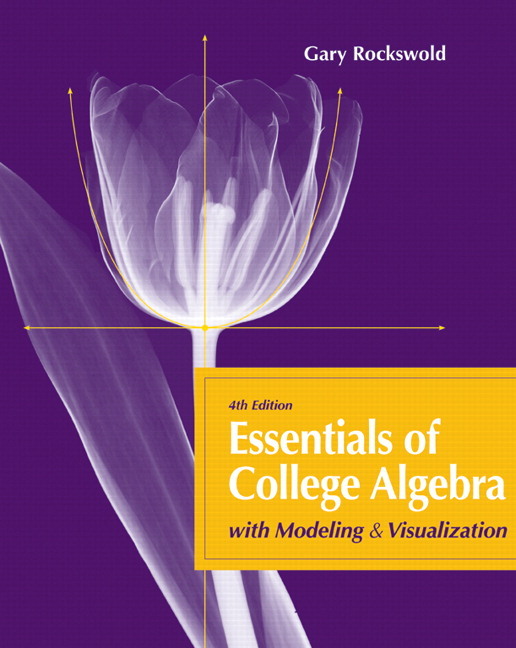 A more comprehensive college algebra text is also available. Applications are woven throughout to introduce mathematics topics and content. These contemporary examples—many of which are updated for the new edition—draw from a wide variety of real data, enabling students to see the relevance of math and become more effective problem solvers. NEW! Getting Started pointers help students develop an overall problem-solving strategy before they begin writing a detailed solution. These appear in examples that require multistep solutions. Extensive exercise sets give students abundant opportunity for practice and review. Every exercise set has been revised to ensure that there are sufficient types of exercises for each mathematical concept and that there is a pairing of odd and even numbered exercises. Comprehensive end-of-chapter material serves as an excellent resource for extra practice and test preparation. Each chapter concludes with a summary of key concepts, review exercises, and extended and discovery exercises. Chapter R, Reference contains review material from intermediate algebra and basic geometry courses. This material is referenced by Algebra Review and Geometry Review margin notes. A Graphing Calculator Appendix provides tips, techniques, and keystrokes for the popular TI-83, TI-83 Plus, and TI-84 Plus graphing calculators, allowing students to easily work on their own. This material is referenced by Calculator Help notes in the margins of the text. Cumulative Reviews, which appear every few chapters, require students to understand and use multiple skills from different chapters. This is an excellent test of comprehension of key concepts in the course. Getting Started pointers help students develop an overall problem-solving strategy before they begin writing a detailed solution. These appear in examples that require multistep solutions. Hundreds of new examples and exercises have been added throughout the text. Real-world data, critical to this approach, are updated throughout so that examples, applications, and chapter and section openers are relevant for today’s students. Each exercise set has been carefully revised to ensure that there are sufficient types of exercises for each example and mathematical concept. Exercise sets are carefully graded with several levels of difficulty. MathXL® and MyMathLab® have been expanded to provide more support to instructors and students. 70% more exercises have been added to the new edition in both MathXL and MyMathLab, giving instructors more flexibility when assigning homework and practice. Sample homework assignments are pre-selected by the author for each section. These are indicated in the Annotated Instructor Edition by a red underline within the end-of-section exercise sets, and the homework sets are assignable in MyMathLab. “Why Math Matters” Animations accompany select applications to help illustrate these concepts for students. Explorations are guided-discovery projects (in PDF), created by Nolan Mitchell (Chemeketa Community College), and can be assigned as class work or homework. These projects can be submitted via digital dropbox and graded by the instructor. Answers to the Explorations are posted under Instructor Resources. Animations were also created by Nolan Mitchell and use GeoGebra. These animations are a collection of interactive discovery exercises designed to help students better understand functions and their graphs. Sample homework assignments are pre-selected by the authors for each section. These are indicated in the Annotated Instructor Edition by a red underline within the end-of-section exercise sets, and the homework sets are assignable in MyMathLab. Chapter 1 has been expanded from four sections to five sections. Increasing and decreasing functions, average rate of change, and the difference quotients are discussed in Section 1.5. Circles now appear in Section 1.2 instead of Chapter R.
In Chapter 2, piecewise-linear functions are now discussed earlier in Section 2.1. Complex numbers have been moved to Chapter 3 in a new section. Chapter 4 has been expanded and reorganized from seven to eight sections, making it easier to cover one section per class. Division of polynomials and real zeros of polynomial functions are now in separate sections. Several topics, such as rational functions, have been revised and enhanced. In Chapter 5 the change of base formula is now presented in Section 5.4, and additional modeling has been included in Section 5.7. The first two sections in Chapter 6 have been reorganized so that systems of equations are discussed in Section 6.1 and systems of inequalities and linear programming are discussed in Section 6.2. Substitution and elimination are both presented in Section 6.1. In Chapter R, additional problems involving factoring and rational expressions have been included. Appendix C, Partial Fractions is included for students who need this topic for calculus. Dr. Gary Rockswold has taught mathematics for 35 years at all levels from seventh grade to graduate school, including junior high and high school students, talented youth, vocational, undergraduate and graduate students, and adult education classes. He is professor emeritus at Minnesota State University, Mankato and has been a principal investigator at the Minnesota Supercomputer Institute. He graduated with majors in mathematics and physics from St. Olaf College in Northfield, Minnesota, where he was elected to Phi Beta Kappa. He received his Ph.D. in applied mathematics from Iowa State University. He has an interdisciplinary background and has also taught physical science, astronomy, and computer science. His passion is to write and speak about the relevance and amazing impact that mathematics has on our society. Outside of mathematics, he enjoys boating, sailing, and spending time with his wife and two adult children.